DOCTOR WHO show-runner Steven Moffat also co-created the very popular BBC series SHERLOCK, which updates Arthur Conan Doyle‘s famous detective by reimagining classic stories in modern London. 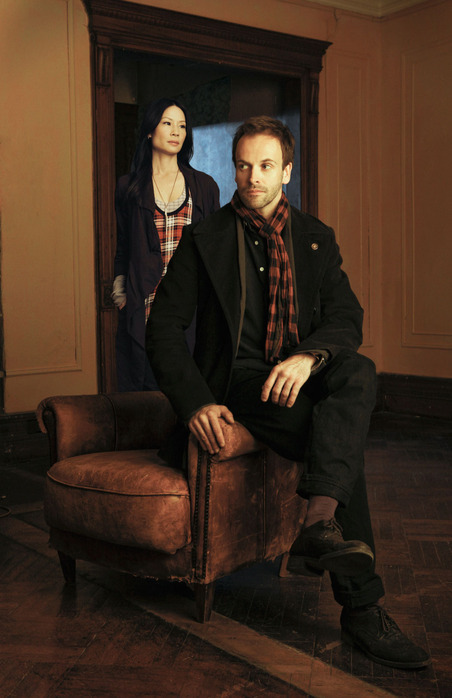 This fall in the USA, CBS will debut ELEMENTARY, a series that transplants Sherlock Holmes to modern New York City. What bothers me is, while SHERLOCK currently airs on PBS, if the next season is more widely distributed here, folks will bash SHERLOCK as a “ripoff” of ELEMENTARY. And if ELEMENTARY tanks, that will preclude SHERLOCK from selling to a major outlet here in the States. 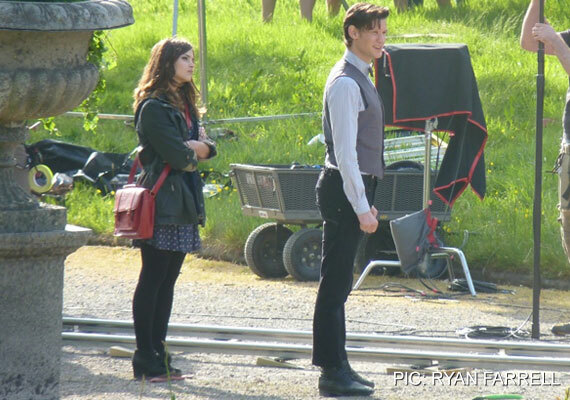 Spy photos from the sets of various episodes of DOCTOR WHO in production are nothing new – but this photo is the first one to show the 11th Doctor (Matt Smith) with his new companion, played by Jenna-Louise Coleman. As a bonus, a loyal fan lurking about the set reports that the new character’s name is… is… [SPOILER WARNING!! ]… “Clara.” [END SPOILER WARNING!!] Well, that’s… a bit underwhelming, isn’t it? I’m not real impressed by that name, but it may not be the character’s real name. [ADDITIONAL SPOILER WARNING!!] Word is, the new companion is suffering from amnesia when the Doctor encounters her, and he takes her on few trips in the TARDIS to try to jog her memory. I can totally picture the Doctor dubbing someone Clara as a temporary measure. If she does remember who she is, perhaps she will recall her “real” name. [END ADDITIONAL SPOILER WARNING!!] This photo depicts production of episode 11, which appears to be a historical set in Victorian times. You will no doubt notice that the Doctor is wearing a waistcoat. The second photo shows that he also has a new long brown coat. 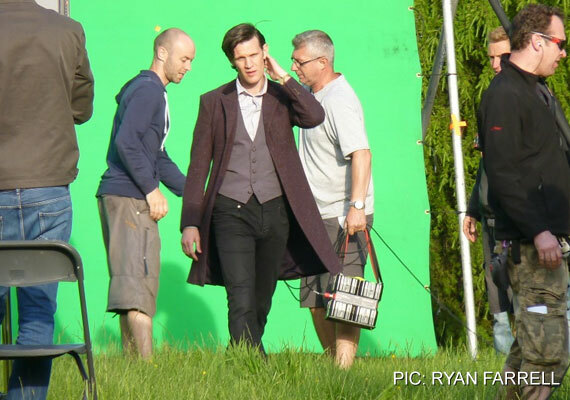 While this does look impressive, I hope the wardrobe change is just temporary and story-dictated, as I love Matt’s tweedy professor look. Why is a Jaguar like a woman — specifically, like a mistress? That was the big question torturing the boys at Sterling Cooper Draper Pryce as they contended with problems stemming from the real women in their lives: Joan, Peggy and Megan. The guys knew that the Jaguar was pretty yet impractical — like a mistress — but how could they sell that idea? With the offices of SCDP buzzing with preparations for the big Jaguar pitch, Herb (Gary Basaraba), the head of Jaguar’s auto dealers’ association, told Pete (Vincent Kartheiser) and Ken (Aaron Stanton) his one non-negotiable demand to win SCDP a yes vote from him: spending a night with Joan Harris (Christina Hendricks). And she won’t be taking dictation, if ya know what he means! Of course they do, and while is Ken is grossed out; Pete sees this as just another negotiation. It’s war! It’s the Battle of Blackwater! 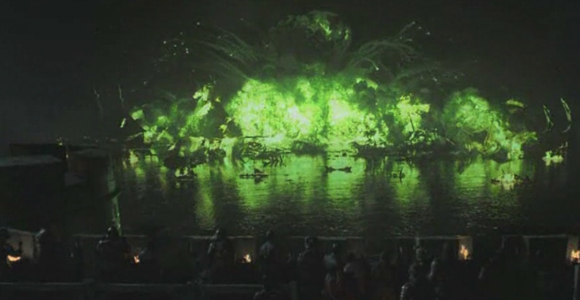 Everything and everyone else took a backseat to the bloodshed in the King’s Landing harbor. And so much the better, because we wouldn’t want to miss a moment of this. As would-be King Stannis Baratheon’s (Stephen Dillane) vastly superior forces approached King’s Landing, Tyrion (Peter Dinklage), Bronn (Jerome Flynn) and the Hound (Rory McCann) prepared to defend the city while sniveling King Joffrey (Jack Gleeson) postured for the press — but since there were no paparazzi, he preened for Sansa (Sophie Turner), who tried to egg him into taking a forward position in the coming battle. As the warning bells sounded, Sansa took refuge with Queen Cersei (Lena Headey) in the Red Keep while the men went to battle. It’s Memorial Day, one of the most significant holidays in the USA – and that’s not just because it marks the unofficial start of summer. It’s a chance to pause and think about others, specifically, the members of all branches of the U.S. military, past and present, active and reserve. Let’s all take a moment to remember that today is not just a day off from work or a reason to fire up the gas grill or an excuse to go shopping. Today is a chance — and an obligation — to remember those who serve our country and make sure that there are shopping malls and offices to go to tomorrow for the rest of us. There are men and women patrolling the most dangerous ground in the world right now, all to keep us safe. We’ve had a volunteer military for decades now, so that means the people in uniform all over the world have chosen their dangerous and underappreciated roles, and in my book, that makes them just a little bit more special. 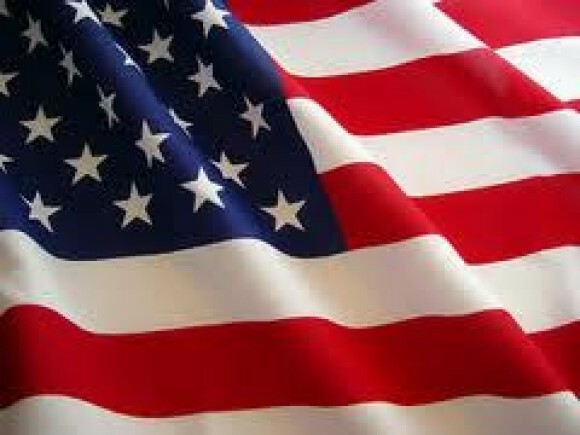 So let’s stop to think and thank a service member, or recall someone who has fallen in service to our country. Without them, the United States of America would not be the place that it is now – in fact, our country would not even exist. Some gave all, but all gave some. It’s the big Memorial Day holiday weekend here in the States, so I don’t have much time to fulfill my blogging obligation. (Plus, I know those of you not in the USA couldn’t care less about our holidays and want a new post!) I saw this fun photo and thought it would be appropriate. 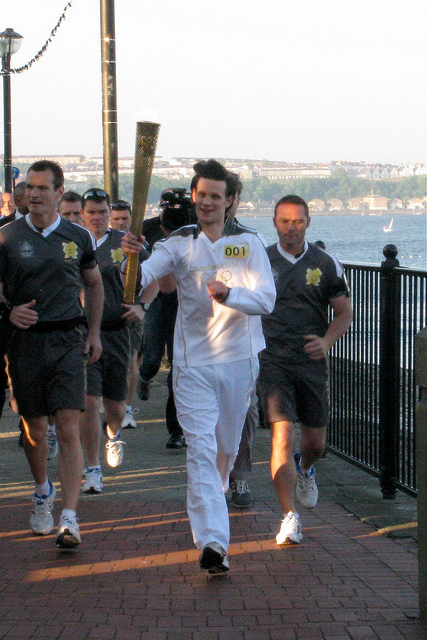 Current Doctor Matt Smith carried the Olympic torch through Cardiff, Wales, today, though not in character — he was acting strictly as himself. I think he looks like he’s having fun. There was significant clamor in the fan community to have David Tennant not only carry the torch but light the flame in the Olympic stadium in character as the Ninth Doctor, since he’d already been seen doing it in the much-maligned second season episode Fear Her. I hear that David was offered the chance to carry the torch but nixed it. So I’m glad Matt literally took up the torch and carried on for Whovians everywhere. 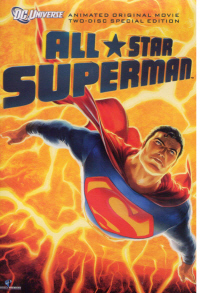 While The Man of Steel, the long-gestating latest chapter of Superman live-action films, continues to languish in limbo and new installments of Batman and Spider-Man struggle for attention in the shadow of Marvel’s The Avengers, I decided to take a look at the 2011 animated direct-to-video feature All-Star Superman, which adapts a highly acclaimed print story written by Grant Morrison and drawn by Frank Quitely. When Superman (voiced by James Denton) saves the crew of the first mission to the sun, he is poisoned by overexposure to the yellow sun that gives him his power. Superman realizes he is slowing dying, and decides to reveal his secret to the love of his life, Lois Lane (Christina Hendricks). It is revealed that Lex Luthor (Anthony LaPaglia) was behind the disaster on the space flight, and he has finally realized his dream to kill Superman, so Supes must put aside his own concerns to save the Earth one last time.